Rialto, rescued by the Seattle Aquarium on Aug. 1, will move to his permanent home at the Vancouver Aquarium sometime this month. 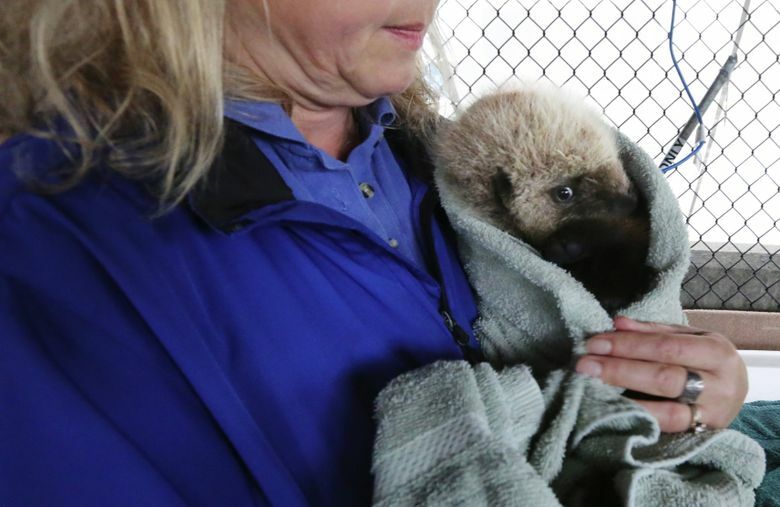 Fatter, sleek and feisty, baby sea otter Rialto is moving to Vancouver, B.C. 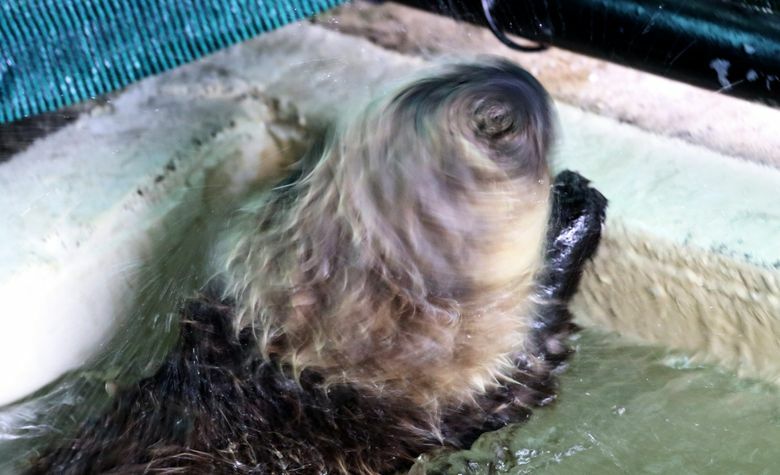 Now fit and over his pneumonia, gaining weight and lively, the sea otter the Seattle Aquarium took in as a rescue Aug. 1 is now on track to move to his permanent home at the Vancouver Aquarium. His paperwork for the transfer was approved Thursday, and the move is expected sometime later this month. 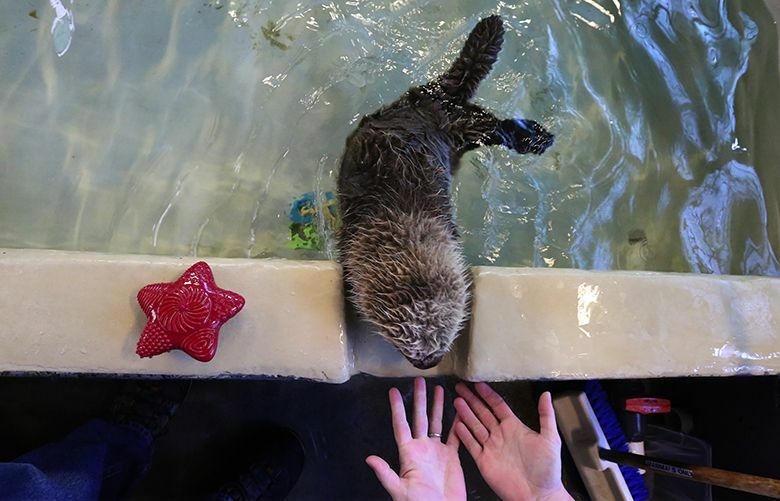 The Seattle Aquarium had contemplated perhaps introducing the baby to a female sea otter in its collection as a surrogate mother, but scrapped the idea to move Rialto as quickly as possible to his permanent home. Rialto has made a near-miraculous recovery since his rescue washed up alone, starving and near death on Rialto Beach in Olympic National Park. 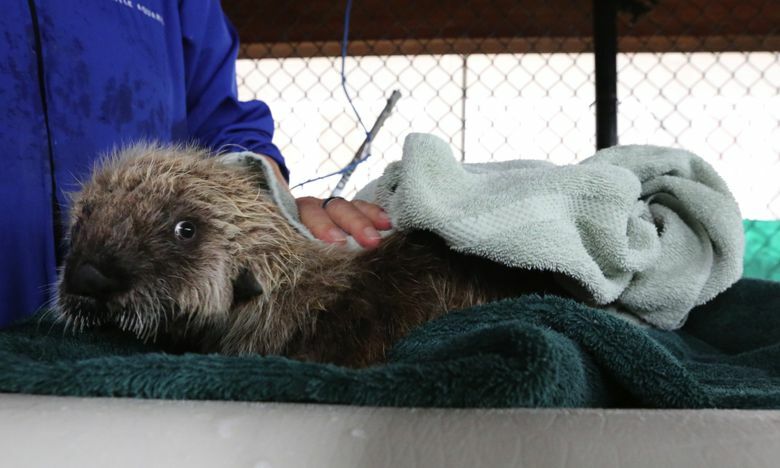 The quick work of a National Park Service ranger and the Washington Sea Otter Stranding Network got Rialto to the aquarium, where he has been in round-the-clock care ever since. He’s kicked the pneumonia he arrived with and on Thursday was feasting on restaurant-grade shrimp, clams and a new treat, pollock fillet. He chewed skeptically for a bit before gobbling it down. Rialto, named for the beach on which he was found, is eating about a quarter of his body weight in fresh seafood every day, just as he should in the wild. He also is being bottle-fed puppy formula, for extra nutrition. 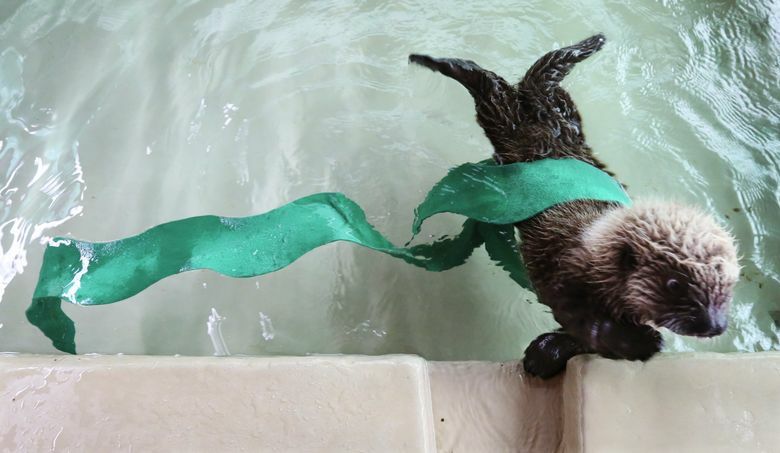 Just up from his afternoon nap, Rialto went for a dip in his pool Thursday afternoon, cruising around with confidence, his furry tail jauntily aloft. Bigger and stronger by the day, he still can’t quite muster enough power to overcome the buoyancy of his natal fur, full of air bubbles, to dive. But he tries, pushing his head under water, blowing bubbles, and in a new move, surfing his body like a little Loch Nessie, up and down. To keep him interested now that he is so alert and feisty, his caregivers at the aquarium keep coming up with new activities and toys. The latest is long strands of heavy duty green felt, the size and shape of bull kelp. They’re actually the felt strips that hang from a car wash, new, clean, nice and durable, so he can’t shred them with his spiky baby teeth. Introduced to the felt kelp for the first time Thursday, Rialto seemed to know just what to do, winding himself in its strand, and pushing it around with his nose. Caregivers also keep a steady stream of ice toys coming, not only for fun, but to help with Rialto’s teething. 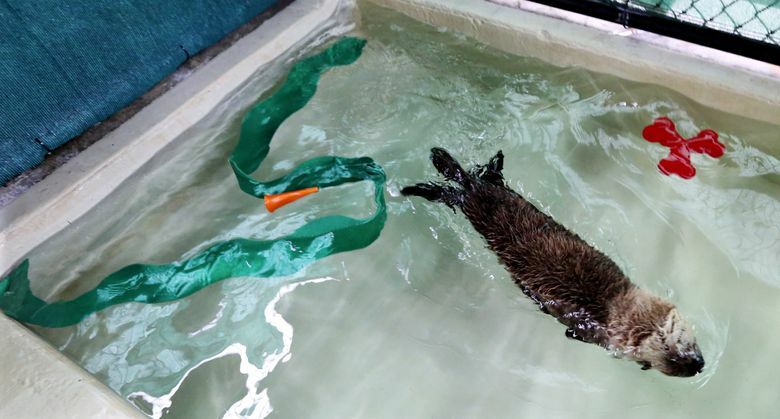 Rialto has worked up to four 20-minute swims a day, but his focus still needs to be on putting on the pounds, Larson said, so his caregivers try to emphasize rest and eating, eating, eating. He sleeps about 14 hours a day. Barely able to groom when he first arrived because he was so weak, he now rolls into a ball to scrunch into a dry towel and nuzzles himself all over to dry and fluff his fur. Sea otters have the most dense fur of any mammal and they must keep it immaculately clean and dry. With no blubber, it is their protection from cold water. Rialto for now is living in his own outdoor enclosure in quarantine, out of public view. He can’t stay permanently at the Seattle Aquarium, though, because there is no room for him there, and he wouldn’t survive in the wild. 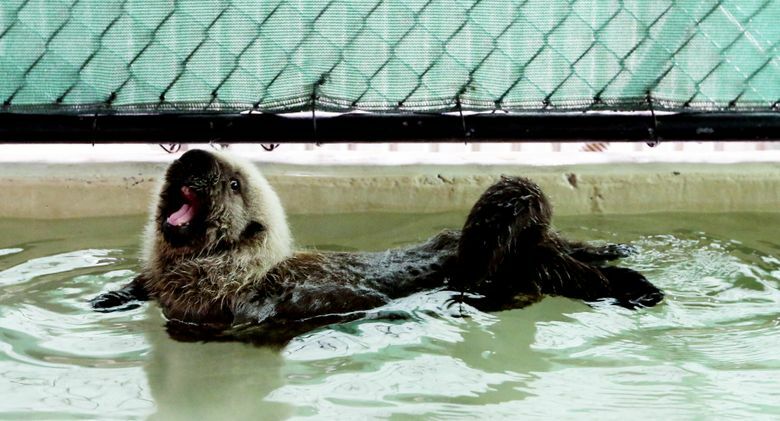 The Vancouver Aquarium was next in line in a closely tracked placement strategy for sea otters in captivity, managed by Traci Belting at the Seattle Aquarium. Rialto also is from a population of otters on the Washington Coast that is not listed for protection under the Federal Endangered Species Act, and so can be translocated across international borders. 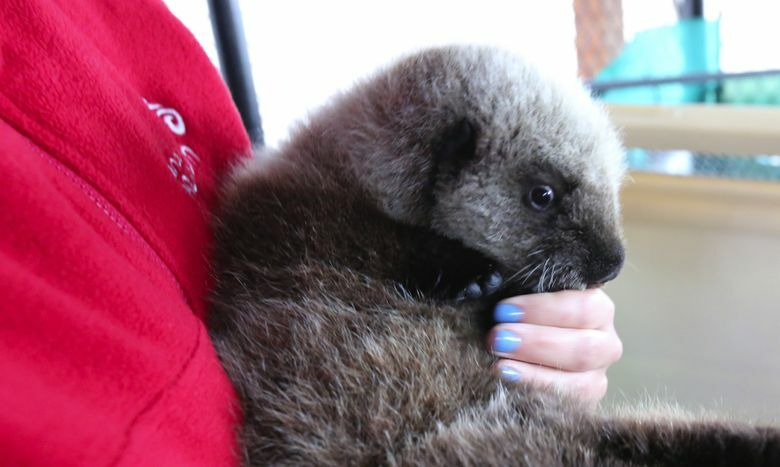 He’ll join the Vancouver Aquarium’s existing population of three otters: Katmai, a 4-year-old female, Tanu, a 12-year-old female, and Elfin, a 15-year-old male. 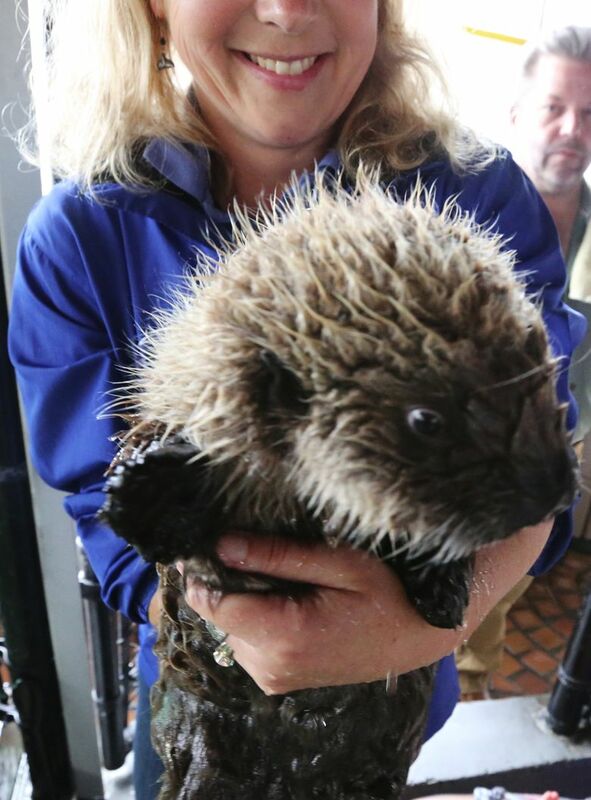 Kristi Heffron, senior marine mammal trainer at the Vancouver Aquarium, was pulling the day shift with Rialto on Thursday, and said she looks forward to his move north. The training he’ll receive will be to facilitate care, not tricks for human amusement. Heffron said Rialto will probably be introduced first to Tanu, who has already been through the experience of accepting Katmai and handled the newcomer’s arrival calmly, Heffron said. At first, Rialto will continue to live by himself to mature and get bigger, said Brian Sheehan, curator of marine mammals at the Vancouver Aquarium. But the public will be able to enjoy him from the start, via a live video feed from his nursery to a monitor in the visitor area, so people can see him grow up. 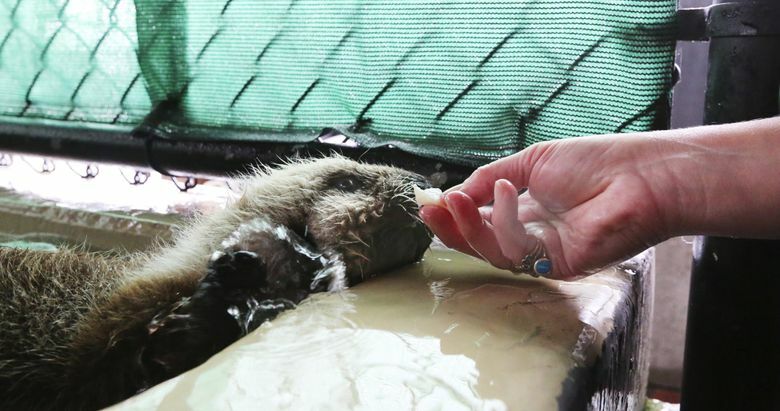 For now, Rialto’s caregivers at the Seattle Aquarium are enjoying watching him grow by the day; he gains nearly a quarter-pound a day, Larson said. He tipped the scales at 9.4 pounds Thursday, up from 5.2 pounds when he arrived. “There will be a little bit of tears,” Larson predicted, the day they pack up Rialto with his favorite toys and fresh seafood, and drive him up north to oversee the handoff to his new home. 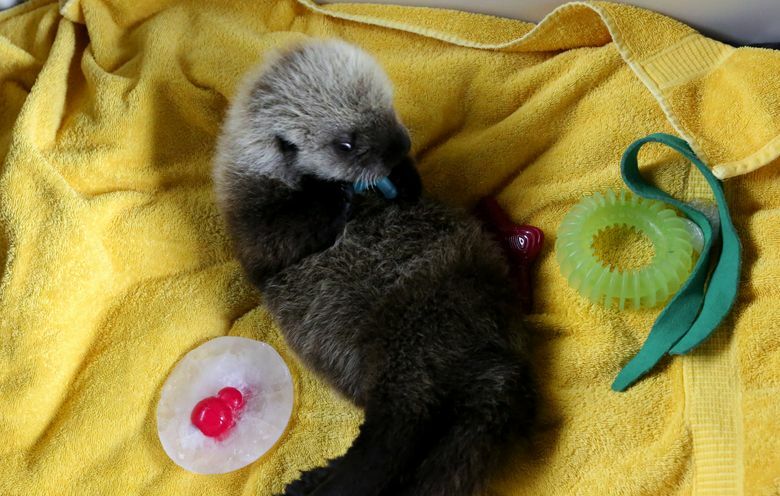 But mostly, the crew at the Seattle Aquarium is just glad to see the baby otter who came to them looking like a crumpled towel thriving, fluffy and fattening. “He’s doing great, reaching all his milestones, and he’s playing a lot more,” Larson said. “Look at how big that belly is now,” she exclaimed, as Rialto belted out a lusty chirp, as if in agreement. Rialto whipped through the turns in his pool, and shimmied his head, shaking off water in a cloud of drops. He came to the edge, and Larson reached in and scooped him up in her arms, wrapping him up in a towel before another nap on his water bed. Heffron was quick with a fresh ice toy, to tuck him in with. “He’s a lot more vocal, and feisty,” Larson said, as Rialto vigorously groomed and squirmed. She blotted his fur with one hand, while with the other fielding him as he scooted around on the towel.